E.M. “Matty” Laird was an American success story – born to a working class Chicago family, he turned his innate mechanical abilities and fascination with flight into a career that put him at the top of aviation’s pioneers. As early as 1915, he was flying a home-made biplane in exhibitions; and in 1919 he set up shop in Wichita, building the Laird Swallow, America’s first commercial aircraft. After moving to Chicago, he designed and manufactured the LC-R Speedwing series of planes. Laird’s planes were high-quality machines, and they were known for their speed. In 1930 and 1931, he built the Solution and Super Solution race planes, flown by Charles “Speed” Holman and Jimmy Doolittle, respectively. Solution won the Thompson Trophy in 1930, and Super Solution won the first Bendix cross-country race in a record-setting time of less than 12 hours. 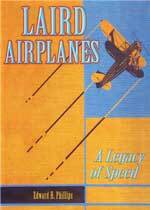 In this profusely illustrated book, Ed Phillips covers Laird’s career, the E.M. Laird Aircraft Co., and the record-setting planes that he built. It’s a fascinating look at the early days of commercial aviation and air racing in the United States. 144 pgs, HB, 9 x 9, 190 photos.